Alexandre Prot and Steve Anavi started working on the project in April 2016. The idea of Qonto was born from a frustration they experienced while building their first startup together, Smok.io, a French pioneer in connected e-cigarettes. Like many entrepreneurs, they were struck by the lack of services banks could offer to manage their daily tasks (e.g. manage their expenses, access accounts online) and simplify their accounting. There was a huge deficiency that was not being addressed, so Alexandre and Steve decided to solve the problem themselves. They built the best banking service for SMEs and freelancers by mixing advanced technology, optimized processes, a best-in-class product, and a stellar customer service. €1.6M seed round in January 2017 followed by €10M series A in July with Valar (a VC firm backed by Peter Thiel) and Alven. Powering more than 10,000 business customers (mostly services companies with between 1 and 150 employees, including Heetch, Happn, and La Cordée, to name a few and also freelancers). Becoming the European leader in the business of neobanks thanks to a great product and a talented 70 plus member team. In the current context of a highly buoyant fintech market — so many companies have been launched in the past few years — Qonto’s founders knew how difficult it would be to become the leader. As a traditional bank, they had to define highly efficient and well-structured processes to their core business. They also had to conform to several regulatory provisions. Money was at stake so they knew the importance of being serious. 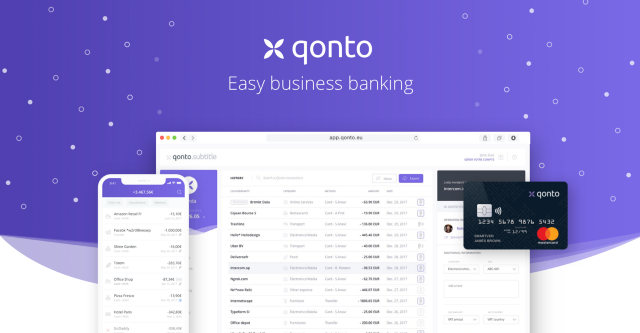 As a modern banking service, 100% online, Qonto cares deeply about the entire customer experience. This explains why their product and services are so centered on the user: they are simple and intuitive. Indeed, Qonto is providing a top-notch solution to easily onboard SMEs and freelancers, allowing them to save time and money. To manage their back office operational activities, they also set the standards high, expecting tools to perfectly fit their needs. A homemade solution was quite tempting but they quickly realized that going that route meant they would be spending too much time on design, development, and maintenance. Using the Forest back office was the perfect solution; it allowed Qonto to stay focused on customer-facing product development and not be forced to spend time reinventing the wheel. The whole setup of Forest was completed in a week. Given Qonto’s high ambitions and — let’s be honest — the complexity of its app, this was a lightning fast performance! Since then, Qonto is improving and customizing their interface on a constant basis (almost every week). It is a collective and continuous dynamic led by both Germain Michou-Tonning (Director of Operations) and Adrien Guyon(Operations Manager). As non-developers who are nevertheless tech-savvy, they have enough autonomy in Forest not to disturb the Tech team too often for help. 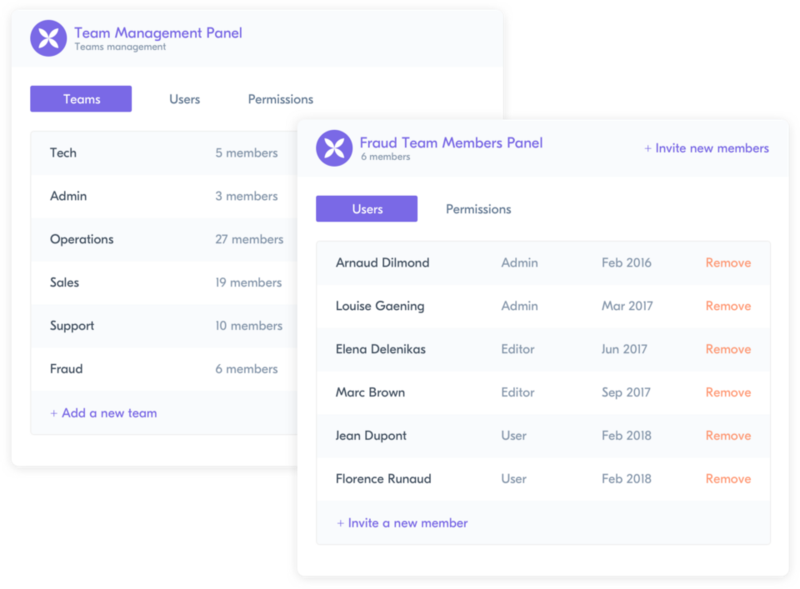 Since Qonto was launched in 2016, the team has grown from just 4 people to more than 70 to support the startup’s rapid growth… and this is just the beginning because they are still hiring in Paris (France). Disclosure: Forest has no access to customers’ data. Nevertheless, these fake data fit perfectly into Qonto’s business reality. All these people are split into six teams (Tech, Admin, Operations, Sales, Support, and Fraud) using Forest. This team-based organization (one of the most-used features of the Forest Pro plan) allows Qonto’s executive team to rationalize data access and create specific views or actions. In terms of operational intensity, the Ops’ team (managed by Germain) is by far the most active of all. 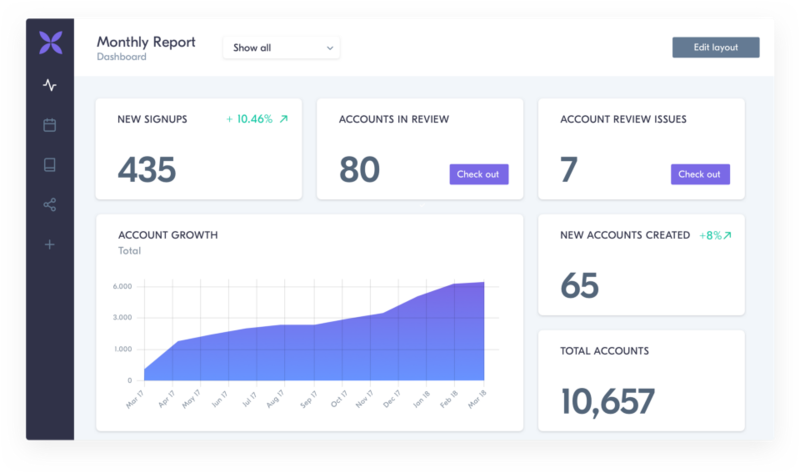 With 15 members, the team is onboarding several hundred new customers per week at the moment, helping some of their 10,000+ business customers at the same time. Qonto’s first mission? Being the best and the most secure service! Remember the last time you contacted your bank advisor to modify your withdrawal limit, dispute a transaction or simply ask for a basic certificate? The odds are that you had a bad experience! With Qonto’s mobile and web apps, you now have more autonomy to manage your account online. Added to this, you can benefit from a best-in-class customer support (average response time: 15 minutes) for all inquiries, courtesy of the Ops’ team. 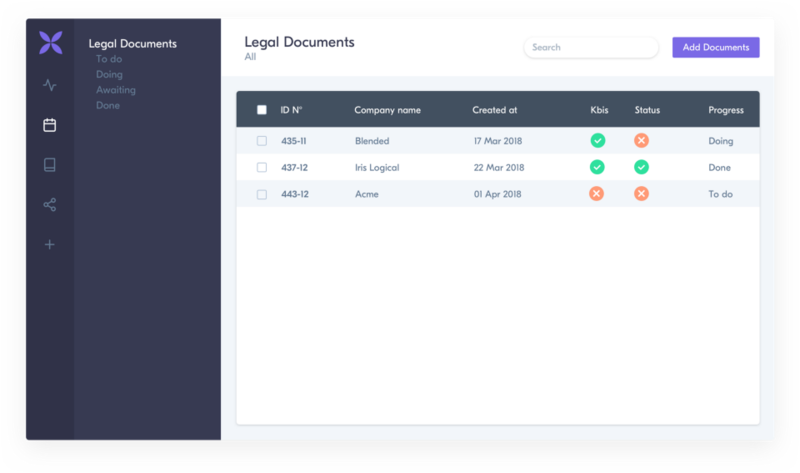 In a customer-dedicated view, each authorized team member can access all relevant information such as account status, details, documents, company team members, credit cards ID and so on. At any time, team members can easily manage requests or even frauds via this custom interface. Moreover, Qonto operates under the payment services regulation, supervised by the Autorité de Contrôle Prudentiel et de Résolution (ACPR), attached to the Banque de France. To conform to ACPR regulations and prevent money laundering and the financing of terrorism, fintech companies must monitor financial flows. To do so, they track all flows in their database and analyze them via powerful homemade algorithms. To visualize the data and take action, Qonto uses the Forest interface. Germain and Adrien, with the help of the team, created several dashboards to help them instantly notice any unusual activity. Between all the graphs — single value, time-based distribution or percentage — they have access to critical data at a glance. If something looks wrong (e.g. a customer with an annual revenue of €2M receiving multiple €10M SEPA direct transfers), they can easily deep dive into the data using the analytics per record feature. When necessary, they can automatically contact the customer via specific smart actions (e.g. send an email with a certain canned answer) or even freeze transactions. 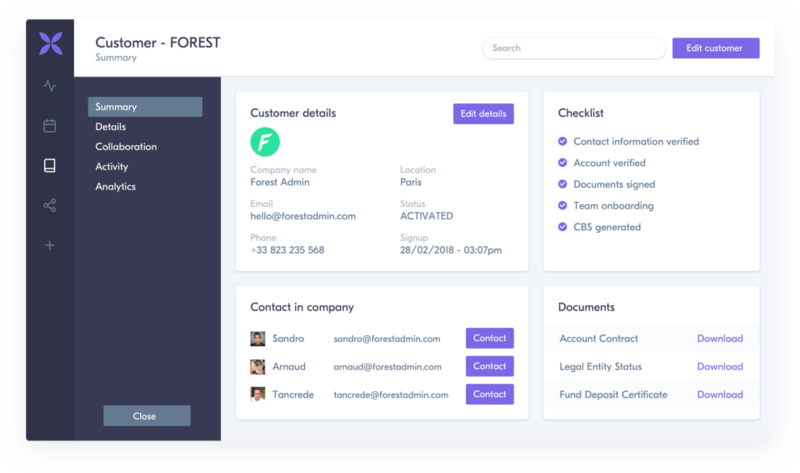 By giving enough autonomy to the Ops team to customize their admin interface and perfectly fit their needs, Forest saved a considerable amount of time for the Tech team. Therefore, developers were able to allocate their energy to the product in order to deliver the best neobank experience ever. Our solution also offered Qonto enough flexibility and security in their hyper-growth. Scaling a company from a few employees to more than 70 is a real challenge and you don’t want your processes or tools to be a stumbling block. Forest wasn’t one of them. 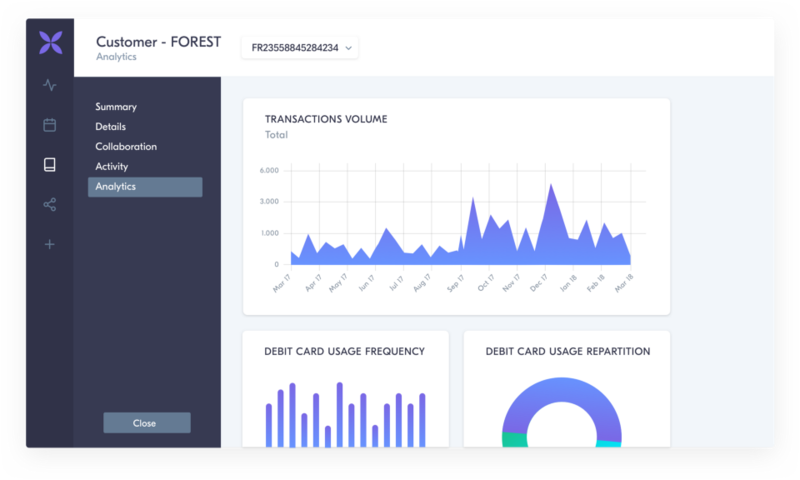 The quality of the support delivered by Qonto and the fraud management system they built within Forest are two important parts of the great customer experience they are providing to their 10,000+ customers. Steve and Alex wanted to launch their fintech startup with European ambitions, so they had to find a name associated with finance and Europe. As you may know, the word ‘account’ in 🇬🇧 is ‘compte’ in 🇫🇷, ‘konto’ in 🇩🇪 and ‘conto’ in 🇮🇹… this is how they came up with Qonto!